Palmdale, CA 93550. Getting there is easy! Exit Avenue S, the park is located between 37th Street East and 40th Street East. 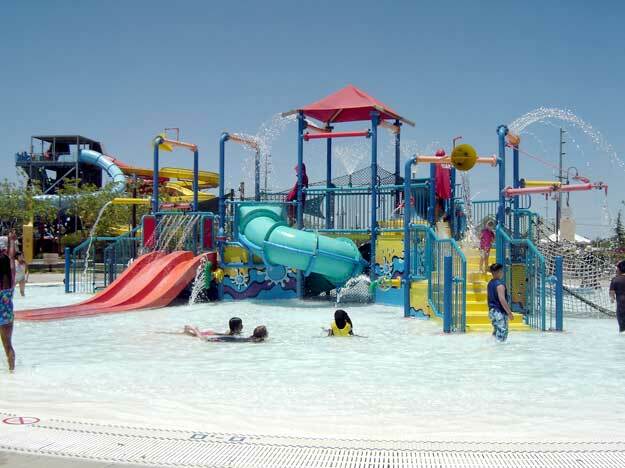 This Water Park is small but its clean and FUN! There are only 3 slides, a lazy river (which most of the adults seem to enjoy) and a kiddie area. The park has a sort of old western town theme to it. The water slide areas are well... water slides but the concession area is built like an old western town. Its cute! They even have a couple of cowboy mascots running around dressed in costume. Man, they must get hot in those get-ups! Palmdale is in the desert! Palmdale residents get a discount off ticket prices. You must show a valid drivers license with any one of these zip codes. 93591, 93552, 93551, 93550. "Like" Dry Town on facebook to get exclusive offers. Find coupons in the La Prensa Popular Newspaper.